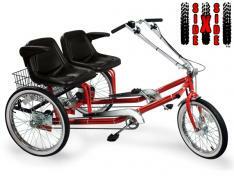 The Team Dual Trike is perfect for physically challenged/companion situations, rental fleets, and vacation resorts. Same as Model TT, but with 3 speed Coaster brake upgrade for more versatile pedaling. SHOWN ABOVE WITH OPTIONAL BACKREST. I was looking for a way to ride safely with my young adult son who has special needs. He can ride a bike but doesn't understand the importance of following traffic rules. He doesn't stop at stop signs!! 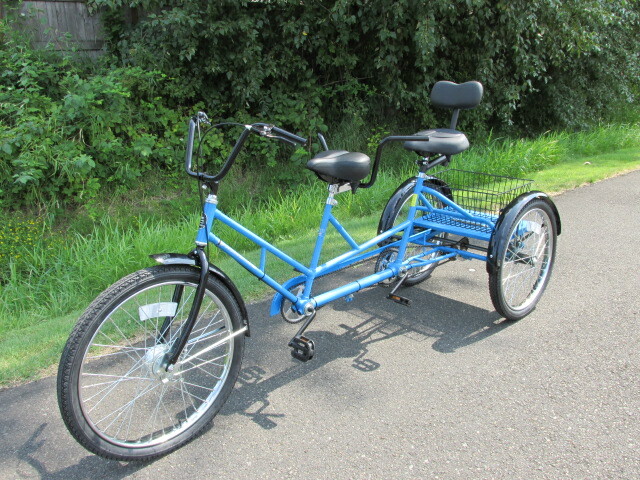 I was concerned that I couldn't handle a regular tandem safely, so, I bought the three-wheel tandem. Perfect for us. After adjusting to the different feel of a three wheeler, we have enjoyed riding together very much. We rode to a recent Special Olympics practice and many of the other athletes admired our bike!! !